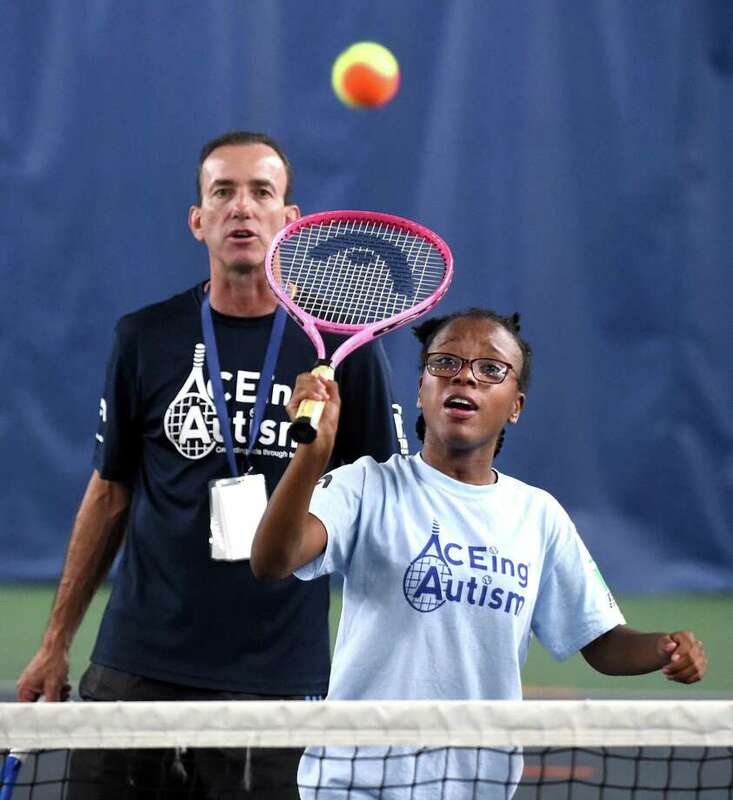 Aceing Autism CT program director Bob Migliorini watches Lauryn Stanley, 14, of New Haven hit the ball during a clinic at the North Haven Health & Racquet Club on Saturday. NORTH HAVEN — Lauryn Stanley is getting the chance to play tennis again, something she did as a youngster. “It’s 100 percent fun. I am much better now,” said Stanley, 14, who will be a freshman at Wilbur Cross High this fall. For Dior Hobson, a sophomore-to-be at Cross, it’s not only about having fun, but learning the proper technique to play shots. Stanley and Hobson are in the midst of a four-week summer session called ACEing Autism being held at the North Haven Health & Racquet Club on Saturdays. It’s the first of its kind in Connecticut, started by Maureen and Robert Migliorini. “At the end of the day, if they have fun or learn one new skill or are able to work through a meltdown, that’s a huge step for that day,” Maureen said. The Migliorini’s son, Aidan, was diagnosed last year with autism at age 2. Among the many questions the couple had was: how will it affect him when it comes to playing sports? So they came across ACEing Autism, a non-profit organization co-founded by Richard Spurling, also the executive director, and Dr. Shafali Jeste, in 2008. It specializes in tennis training programs — a perfect opportunity for Bob Migliorini, the longtime tennis coach for the North Haven girls team and both the Albertus College men’s and women’s programs. North Haven became the first in the state to start a pilot program and the 63rd overall throughout 29 states. Maureen said 12 people attended the pilot program held last month and currently there are eight people combined for the two summer programs (ages 5-10 and 11-18). Among the important aspects of the program is the direct tutelage. There is at least one instructor required per participant. In many cases, like here in North Haven, there are at least two. The volunteers have come from Bob’s tennis teams past and present That includes Jessica Tran, a 17-year-old rising senior at North Haven who mainly plays doubles for the Indians’ program. Alyssa Migliorini, a former Register All-Area tennis player for North Haven, recently earned her Master’s degree in speech pathology. She works at Meliora Academy, a private, special education school in Meriden. Among the topics in the curriculum include hand-eye coordination, racquet skills, volleys, groundstrokes and actual games alongside the volunteers. ACEing Autism CT’s fall program begins Oct. 6 and runs for eight weeks (skipping the Saturday after Thanksgiving) through Dec. 1. Each session is $20. Equipment is provided, and parents can apply for scholarships when they register at the host website, aceingautism.org. For further information on the fall session, email aceingautismct@gmail.com.